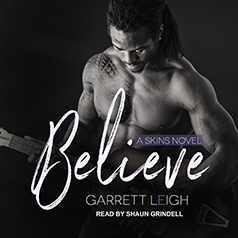 Garrett Leigh presents the third book in her Skins series. Contains mature themes. Flight paramedic Rhys Foster is hooked on adrenaline. By day it's blood and guts, by night it's the thrill of the club. With a different face in his bed most nights, he doesn't have time to be lonely . . . right? Entertainer Jevon Campbell is a play therapist like no other—dancer, magician, acrobat, he brings it all to his global mission to help children in need laugh again. He's on a rare home visit when he encounters enigmatic Rhys in a London bar. Their connection is instant, but Rhys fast realises Jevon's easy confidence doesn't stretch as far as the bedroom. He has no idea how mesmerizing he is—how beautiful—and Rhys resolves to show him. They grow closer, but time isn't on their side. Rhys seems unable to articulate how he feels, and with Jevon's imminent departure from the U.K. hanging over them, their separate commitments could tear them apart forever. As the days slip by, Rhys must learn to believe he's worth the happiness Jevon is offering.